« Day 401 in Beijing: Beijing Swingers? 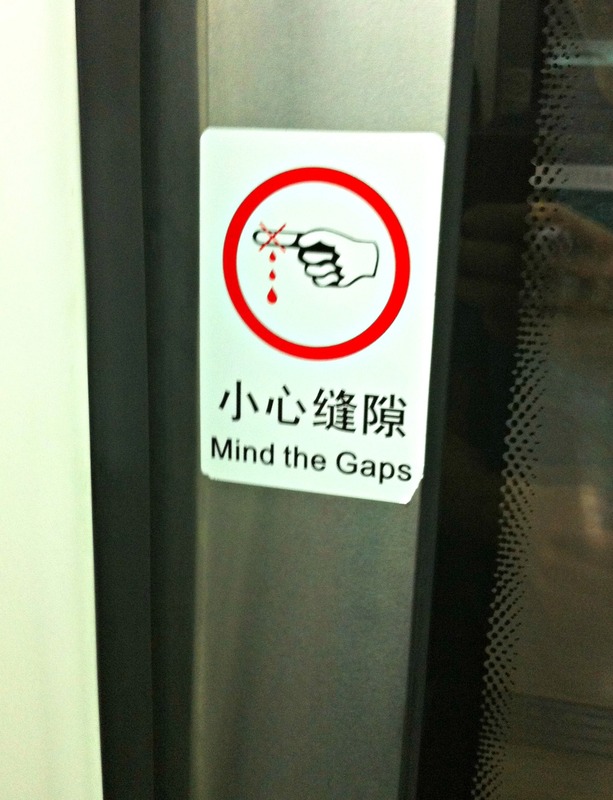 Day 402 in Beijing: Mind The Gaps…And Your Fingers! 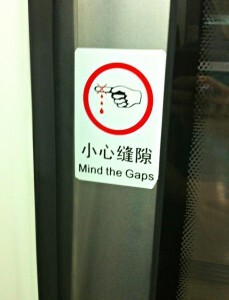 I have to say that when the Chinese authorities give warnings, they don’t mess around. This is a very good example of what might happen if you don’t mind the gaps. I have yet to see a sign as graphic as this in an elevator anywhere else. It reminds me of the smoking lady and her throat tube in the PSA when we were younger and they were trying to scare us into not smoking. I also remember studying negative reinforcement and how it works for a very short time and then loses all real ability to “scare someone” into changing their habits since it is based on something that MAY happen in the future but has almost no relevance to the individual at this moment. So, when trying to quit a habit or an addiction, help someone notice what the negatives are in this moment, and also look at the long term effects. Also, make sure to look at the positive short term and long term effects because there is almost always something that is pain relieving, in some way, if someone is drinking, smoking or doing whatever the other person feels is negative. If the person isn’t able to understand why this “negative” behavior is actually someone useful for them (drinking relieves pain or lets them forget their worries) it is very difficult for them to find an alternate habit that is more “positive” that will help them move on. At least, that is the way I work in my profession and with my clients. And, by the way, with my own choices and habits. I choose not to stick my finger in an elevator door, so I don’t have to learn this with a very serious negative reinforcement of having my finger cut off.